The call came on a Saturday afternoon after we had closed. I believe there is a universal law that whatever trouble your pet gets into, you won’t become aware of it until your veterinarian’s office has closed for the day. The caller (who just happened to be my sister Jane) was staying at a beach house in Delaware with some friends. Returning from lunch, they were greeted by a damaged bottle of Rimadyl Chewable Tablets lying on the floor, next to the open carry-on bag they’d been stashed in. All of the pills were missing. The medication belonged to one of the friends’ dogs, a Westie named Sophie. But Sophie’s owner insisted that her well-behaved terrier would never have pilfered the pills. All eyes turned to Sherman, my sister’s adorable English cocker spaniel, who has an innocent face but has been known to rummage through suitcases. Rimadyl, like aspirin, is an NSAID. I determined that the dose that had been ingested could cause stomach and intestinal ulceration and bleeding, so I prescribed a regimen of Prilosec and Pepcid. One quick trip to the drugstore, and Sherman was dosed up and looking good. The incident prompted me to consider that although we worry about pets accidentally ingesting human medication, we seem to get more phone calls about pets getting into their own meds. Flavorful chewable pet meds are a double-edged sword. Pet owners and veterinarians alike hate wrestling with their pooches while giving pills, so these drugs are a boon. But when your pet eagerly gobbles his or her medication, there’s a potential for trouble. A pet can easily sniff out his favorite chewable pill right through the bottle. And that bottle, although childproof, is no match for the sharp teeth and claws of a dog or cat. So what measures can you take to avert medication mishaps? Of course you’ll want to store the containers in a cabinet that’s out of reach of the pet. I once had a 20-pound cocker spaniel who reached a cake by jumping from the kitchen chair to the table, and from there made what must have been a very impressive-looking vault to the countertop. So keeping your stash of pet meds on a counter isn’t good enough. An article on WebMD suggests never shaking your pet’s pill bottle when it’s medication time, because it might draw undue attention to the actual bottle of pills. Make sure that you keep human and dog meds in different places, so you don’t mistakenly give your pet a human drug (or vice versa). Traveling is particularly tricky, as illustrated by the above Rimadyl debacle. Carefully go through the rooms where you’re staying and make sure all meds, pet and human alike, are safely zipped up in luggage and placed out of reach. Close doors to bathrooms and bedrooms if possible. And do a little research before you travel: Grab your smartphone and enter the numbers for Vernon Hills Animal Hospital (847-367-4070), the local animal emergency clinic, ASPCA Animal Poison Control ASPCA Animal Poison Control(888-426-4435) and the Pet Poison Helpline (800-213-6680). Pet Poison Helpline . Finally, don’t assume that your pet wouldn’t eat medication just because she has never done it before. Although Sherman was implicated as the culprit at the beach house that day, it was Sophie who ended up with bloody vomiting and diarrhea that night, and with a bill of over $1,500 at the emergency clinic! If you were to see Chloe walk in our front door, you’d first notice the 12-year-old yellow Labrador’s protruding ribs and pelvic bones. Then you would see her tucked-up abdomen and sunken cheeks. After the shock of seeing her emaciated body, you might think: How cruel of these owners to keep this old dog alive! How selfish of them. Last summer, Chloe’s people noticed an unexplained weight loss. 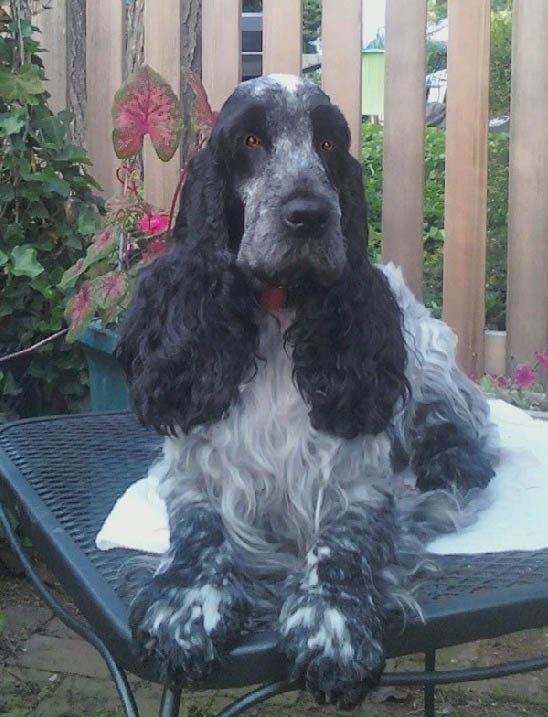 After tests were run and an ultrasound performed at Veterinary SpecialtyClinic in Buffalo Grove, the presumptive diagnosis was cancer. A definitive diagnosis would require surgery, and treatment would probably involve more surgery and chemotherapy, with no guarantee of a longer life. So owner Jaquelyn and her husband reasonably decided on palliative care. In veterinary care, many of the considerations near the end of life are markedly different from those made at other stages of a pet’s life. We need to determine such things as when treatment is futile, the doctor’s duty to the patient, the emotions involved in the situation, and who should decide what the patient’s best interests are. Most of our clients determine their pet’s best interest based on the degree of pain the animal is living with. However, in the Netherlands, where euthanasia of humans is accepted, two studies found that only 5% of those who ended their lives reported that pain was their sole motivation. Similarly, our patients can be distressed by other conditions, such as difficulty breathing, nausea, profound weakness, and feeling sick and toxic (as in liver and kidney failure). So we help our clients answer the question “what are the patient’s best interests at this time?” Some owners have no trouble determining the answer; others are profoundly confused and agitated. We veterinarians can assist uncertain owners by helping them assess their pet’s pain and other causes of discomfort or suffering. In our hospital, if our collaboration with the pet’s owner determines that it is in the patient’s best interest, we focus on palliative care for life-threatening illness. Our goal is to enhance the pet’s comfort and give him or her the best possible quality of life. There are many ways of achieving that goal, including drugs for pain, loss of appetite and anxiety; physical therapy; acupuncture; and therapeutic laser. With regard to Chloe, although her illness suppressed her appetite, most of her discomfort was from her arthritis, not her cancer. 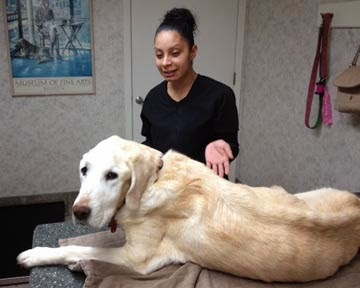 She gets special homemade food, takes a cocktail of drugs for her decreased appetite and arthritis, and comes in once a week for an acupuncture and therapeutic laser treatment. She clumsily marches that skinny body straight to the counter where the Pup-Peronis are kept and stares at the jar with anticipation. And she doesn’t grab that treat with any finesse — I still have to watch my fingers! So if the casual observer harshly judged the person at the other end of Chloe’s leash, they would be wrong. They didn’t pick up on Chloe’s bright, alert eyes that still reflect some joie de vivre. Jacquelyn and I assess her quality of life weekly, and we feel that we’ll both know when the moment to let go has arrived. But for now, it’s not quite time to say goodbye. 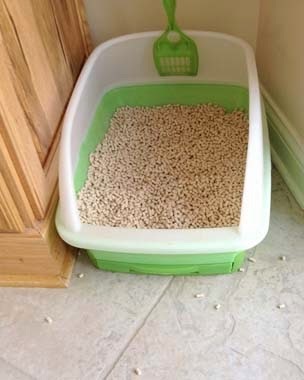 The best cat litter: A cat problem, litter-ally solved! Cat owners often tell us, “I love my cat, but I hate the litter box.” Right back at ya, cat owners! One day, as I was once again vacuuming up litter that had been tracked 15 feet from the box, I had an epiphany: Why am I putting up with this? When it comes to kitty litter, there must be a better mousetrap! For years, I had been using non-scented bulk clumping litters. The odor control was decent – though, let’s face it, there are always going to be some bad smells -- and the excellent clumping made both #1 and #2 easy to clean up. But my back isn’t what it used to be, and hauling those heavy containers of litter was giving Tylenol too much business. And then there was the aforementioned scatter. I was over it. I began my intrepid research by perusing the litter aisles at Petco. So many choices! I decided to start with all-natural products. First up was a walnut-based litter, Blue Naturally Fresh Quick Clumping. Then I tried World’s Best Cat Litter, which is corn-based; Feline Pine; and even a wheat-based litter. I moved on to Fresh Step Crystals and a pearled litter. Each time, I transitioned my two cats by setting up a second box with the new litter. I also slowly replaced the regular litter in their original box with the new litter. After about a week, I allowed their original box to get dirty. I was surprised (and very lucky) that my cats accepted each new litter without any problem. I was prepared to stop my experiment when I found the perfect product, but it didn’t seem like that would ever happen. All of the litters tracked as much as or worse than my old standby clay litter. Some of them turned to mush when they got wet, which made cleaning the box messy and unpleasant. One of them, the World’s Best, had such fine dust that I had to wear a surgical mask to handle it, and my hair would smell like corn for the rest of the day. Finally, one of my clients, to whom I will always be grateful, told me about the Breeze Litter System. It’s a green-and-white plastic box with a pull-out tray in the bottom. A pad fits into the tray perfectly. You fill the box with a non-absorbant pelleted litter. The urine goes right through the pellets and soaks into the pad. With two cats, I have to change the pad every 36 hours. I reverse the tray about halfway through that time period. The stools are easily scooped off the surface of the pellets. And the scatter? All but gone! Although the pellets are virtually weightless to me, my cats don’t seem to be able to fling them very far. Twice a day, I toss about 10 pellets back into the box. I have to replace the pellets only once a month, and I buy the pads online in bulk. So although the system might seem to be more expensive, it’s not. And what it’s done for my back? Priceless!